Our Gentle Formula is a milk-based low lactose formula; the formula contains one-fourth the lactose of a standard, milk formula. If your baby seems to be having trouble with feedings, ask your pediatrician about Member's Mark Gentle® Infant Formula. The American Academy of Pediatrics (AAP) recommends all infants be fed breast milk or a milk-based infant formula for at least 12 months. Member's Mark Gentle® Formula offers complete nutrition with pediatrician-preferred milk protein; the proteins are just broken down into smaller parts. 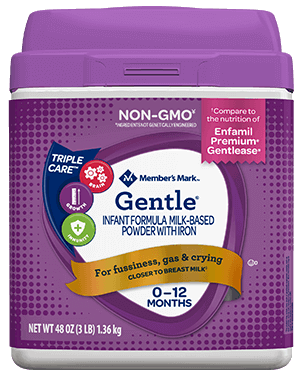 Member's Mark Gentle® is clinically proven to be as well tolerated as Enfamil® Gentlease®. * In fact, we encourage you to conduct a side-by-side comparison of our label to the nutrition of Enfamil® Gentlease® national brand formula. Read the labels and compare ingredients and nutrient levels. Member's Mark Gentle is inspired by mother's milk. It features DHA, a fatty acid for brain and eye development that is found naturally in breast milk. It also contains choline, which occurs naturally in mother's milk and supports brain and eye development. Inspired by breast milk, Member's Mark Gentle contains prebiotics for immune support and digestive health, as well as antioxidant vitamins and minerals, including Vitamin A, C, E, and Zinc for immune support. Ask your baby's pediatrician if Member's Mark Gentle® Infant Formula is the right formula for your baby. 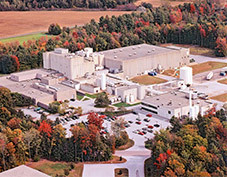 Our infant formula-manufacturing facilities are located in Vermont and Ohio, U.S.A. Our dairy ingredients are sourced from leading dairy markets, including the United States, Canada, and New Zealand. The FDA-inspected, ISO 9001:2015-certified facility has been producing infant formulas for more than 30 years in strict compliance with good manufacturing practices (GMP). Our factory and formulas meet an array of quality assurance and safety certifications. CORN SYRUP, NONFAT MILK, PALM OLEIN, PARTIALLY HYDROLYZED WHEY, SOY OIL, COCONUT OIL, HIGH OLEIC (SAFFLOWER OR SUNFLOWER) OIL, AND LESS THAN 2%: MORTIERELLA ALPINA OIL*, CRYPTHECODINIUM COHNII OIL**, L-CARNITINE, MIXED TOCOPHEROL CONCENTRATE, MONOGLYCERIDES, SOY LECITHIN, TAURINE, CALCIUM CARBONATE, CALCIUM CHLORIDE, CUPRIC SULFATE, FERROUS SULFATE, MAGNESIUM CHLORIDE, MANGANESE SULFATE, POTASSIUM BICARBONATE, POTASSIUM HYDROXIDE, POTASSIUM IODIDE, POTASSIUM PHOSPHATE, SODIUM CITRATE, SODIUM SELENITE, ZINC SULFATE, ASCORBIC ACID, ASCORBYL PALMITATE, BETA-CAROTENE, BIOTIN, CALCIUM PANTOTHENATE, CHOLINE BITARTRATE, CYANOCOBALAMIN, FOLIC ACID, INOSITOL, NIACINAMIDE, PYRIDOXINE HYDROCHLORIDE, RIBOFLAVIN, THIAMINE HYDROCHLORIDE, VITAMIN A PALMITATE, VITAMIN D (CHOLECALCIFEROL), VITAMIN E (dl-ALPHA TOCOPHERYL ACETATE), VITAMIN K (PHYTONADIONE). ***Enfamil Premium(R) Gentlease(R) are registered trademarks of Mead Johnson & Co. Member’s Mark Gentle(R) is not made by or affiliated with Mead Johnson & Co.
****Comparison based on June 2018 price survey of Member’s Mark Gentle(R) Infant Formula vs. Enfamil Premium(R) Gentlease(R). Actual prices may vary by store location and product.